inField Solutions Hires Three Key Sales Positions Expecting Significant Growth - InField Solutions Inc.
INFIELD SOLUTIONS WELCOMES THREE NEW ADDITIONS TO THE SALES TEAM! 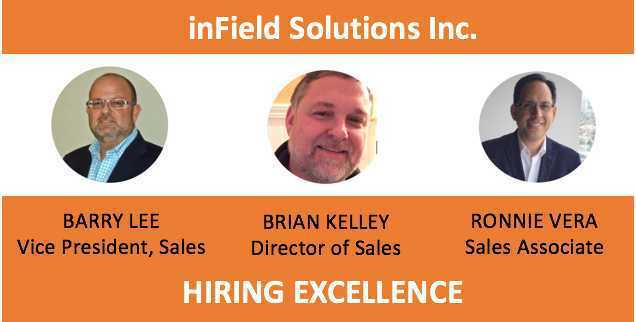 April 30, 2018, Toronto, ON – inField Solutions Inc. is proud to announce and welcome three new members to our professional sales team; Barry Lee, as the Vice President of Sales, Brian Kelley as the Director of Sales, Midwest USA, and Ronnie Vera as a Sales Associate. Barry Lee will be responsible for sales team leadership, building and managing the affiliate sales program, driving revenue, and contributing in product and vendor selection. Barry Lee started his transportation career back in 1980 in a family run Limousine company, where his drive and tenacity grew the business to 18 vehicles and 30 drivers in this fast-paced industry. Passionate for helping companies with their fleets, Barry started applying his expertise to advise them on their telematics and dispatch requirements which has helped him become a go-to consultant in this field. In his free time, Barry loves to play tennis, spend time with his friends and family, especially his grandson Logan. Barry is grateful now for the opportunity to assist inField Solutions as Vice President of Sales in the company’s ambitious growth and expansion plans across North America. Brian will be responsible for building and managing the affiliate sales program in the Midwest USA, driving revenue, and contributing in product and vendor selection. Brian Kelley is a seasoned Entrepreneur, IT Executive, Senior Sales professional with proven leadership skills, with over 25 years tenure focusing on improving business metrics, operational accountability, and increased profitability. Goal oriented to achieve sustainable growth while fostering strategic relationships, Brian’s diverse background in manufacturing IT, cellular and telematics SaaS based companies provides extensive knowledge in consultative solution and SPIN based sales practices, B2B strategies, software implementations and project management while ensuring excellent customer service metrics. Brian achieved personal as well as team performance recognition on both a regional and national level for several years. Brian has two successful sons and his hobbies include golf, traveling and Standardbred horse racing for many years. Fun Fact: During his racing career, he set a North America track record for a 4 year old filly trotter at Woodbine in 2009. Ronnie Vera is a geek with more than 20 years in tech multinational corporations in Latin America, managing large scale projects. Ronnie is passionate about bringing value to customers through tailored solutions. He loves spending time with his family, reading, and playing guitar with his son. Brian is very excited about joining the inField Solutions sales team and boost its growth. inField Solutions is an integrated platform designed for organizations with field resources to standardize how they work and maximize the visibility of their people, assets, vehicles, and equipment. For more information, news and events visit infieldclipboard.com or as of May 15, 2018 infieldsolutionsinc.com. Plus, reduced cost or better utilization of the following items. Increased use of your Mobile Devices – they should be used for more then just voice, email and text. Better utilize your staff … go from doing mandate tasks to revenue generating activities. Improved customer satisfaction by improving how your communication and work. Increased ability to audit your business.